The Duchess of Cambridge, Kate Middleton, was on hand to open the Wimbledon championships on Monday, and not only did she wear a gorgeous new (custom made) Dolce & Gabbana dress, but she debuted a new haircut as well. It's definitely the shortest chop we've seen from Kate, but we love it. Wearing it down in a bouncy blowout (as she loves to do), you could definitely tell that Kate chopped off about 3-4 inches of her famous tresses. It's not quite a bob, but is this her first foray into the world of lobs? Is it just to beat the summer heat? Is she slowly succumbing to the famed 'mom' haircut?! Either way, it looks gorgeous on her. Just ahead of her next royal tour, where she and William will take Prince George and Princess Charlotte along for a week-long trip to Germany and Poland, the Duchess took her seat in the royal box for one of her favorite sports. She's newly the Patron of Wimbledon after the Queen handed her the reins in 2016 and happily cheered on British favorite Andy Murray. 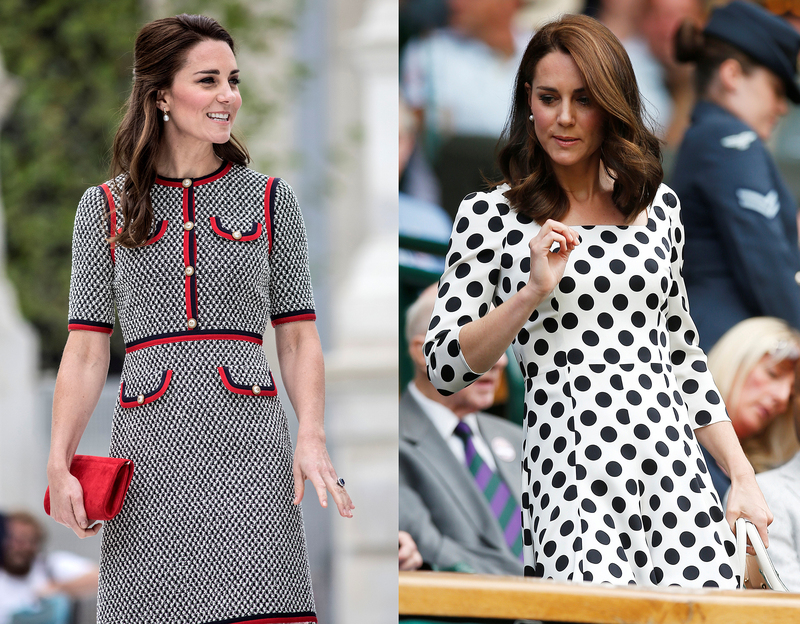 Kate wore a black and white polka-dotted dress by Dolce & Gabbana that retails for just over $2000 and is available in *very* limited sizes at FarFetch. Her dress, of course, came with a custom neckline from anotherD&G dress. She carried her white 'Quincy' Victoria Beckham tote and wore a new pair of -- quite affordable! -- heels by Office. Click through above for more photos from Day 1 at Wimbledon.